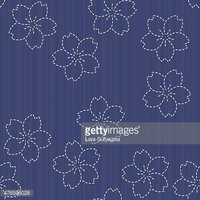 Sashiko motif - blooming cherry flowers. Floral backdrop. Needlework texture. Vertical background. Wavy lines and circles. Seamless pattern. 'Momiji!' card. Autumn leaves. Simple postcard with scattered maple leaves. Small Stones in the Soil. Seamless vector pattern. Abstract Traditional African Ornament. Seamless vector pattern. Monochrome sashiko motif with copy space for text. Geometric sashiko template. Copy space for text. Plover (chidori) motif. Abstract japanese needlework. Sashiko. Seamless texture. Classic japanese quilling. Sashiko. Seamless texture. Traditional Japanese Embroidery Ornament with circles. Sashiko.